Pioneers is keenly aware of the need to equip workers well for the challenging task of church planting among unreached people groups. Our primary equipment is God’s Word, the Bible. Being able to use Scripture, not only to feed and care for ourselves, but also to create an effective ministry approach toward the unreached requires serious preparation in both the content and implications of the Word. The “Pioneers Bible Certificate” is intended to provide a solid foundation toward that end. Our hope is that you will find these courses helpful and that you will pursue them wholeheartedly as unto Christ. Enjoy! This course is an introduction to the Old Testament using the first half of BibleMesh’s Biblical Story curriculum. The Biblical Story Course is a complete Bible overview presenting the record of God’s redemptive acts as a single story from Genesis to Revelation with overview teaching videos by Dr. Timothy Keller. This course is an introduction to the New Testament using the second half of BibleMesh’s Biblical Story curriculum. The Biblical Story Course is a complete Bible overview presenting the record of God’s redemptive acts as a single story from Genesis to Revelation with overview teaching videos by Dr. Timothy Keller. This course uses curriculum from Third Millennium Ministries. By examining the history, value, and use of the Apostles’ Creed, as well as the details and significance of each of its articles of faith, this course demonstrates the relevance of key doctrines to the modern church. The Triune God: Based on the textbook, The Triune God, author and professor Fred Sanders provides you the riches of Christian thought on the Trinity for the sake of theological renewal. Exploring the biblical, creedal, and confessional shape of this central Christian doctrine, The Triune God course secures knowledge of the Trinity in rightly ordered theological language. Material in this course is presented on the basis of the way the Trinity was revealed in Scripture. This course also offers you theological principles for reading Scripture in a thoroughly Trinitarian manner. Historical Theology: In this course, Gregg Allison offers students the opportunity to study the historical development of theology by a topical-chronological arrangement, setting out the history one doctrine at a time. This approach allows students to concentrate on one tenet of Christianity and its formulation in the early church through the Middle Ages, Reformation, and post-Reformation era, and finally into the modern period. Know Why You Believe (Apologetics): Based on the book Know Why You Believe, apologist K. Scott Oliphint introduces you to compelling reasons for a belief in God, the Bible, and the foundational teachings of the Christian faith. The Know Why You Believe course is useful for both traditional and non-traditional students wanting to better understand defenses of Christian belief. Each unit covers a foundational teaching and includes a rationale for that teaching, responses to common objections, reflection questions to prompt further consideration, and suggested readings for further study. Systematic Theology 1: This course, built from Wayne Grudem’s Systematic Theology with video resources, introduces the doctrines of God’s Word, God, and humanity. Systematic Theology 2: This course, built from Wayne Grudem’s Systematic Theology with video resources, introduces the doctrines of Christ, the Holy Spirit, redemption, the church, and the future. Genesis: This course, based on Tremper Longman III’s book Genesis (Story of God), offers a clear and compelling introduction to the entire book of Genesis, guiding students in creatively and faithfully living out its message in their own contexts. Longman’s story-centric approach illuminates the book of Genesis in light of the Bible’s grand story. The Torah Story: This course introduces the first five books of the Old Testament. Using resources from the book The Torah Story and teaching videos from author and professor Gary Schnittjer, this course emphasizes the content of the text itself, moving beyond debating dates and theories of authorship into understanding how these five key books of the Bible help us understand the story of salvation. The Message of the Prophets: In this course professor J. Daniel Hays offers a scholarly yet readable and student-friendly introduction to the Old Testament prophetic literature, presenting the message of each prophet in both its historical and biblical context and tracking that message through the New Testament to discuss what it means for believers today. Four Portraits, One Jesus (Gospels): Based on the textbook, Four Portraits, One Jesus, author and professor Mark Strauss provides an expert and understandable introduction to Gospels, the first four books of the New Testament. Thinking through Paul: In this course, New Testament scholars Bruce W. Longenecker and Todd D. Still provide a thorough, college or seminary level introduction to the life of the apostle Paul and the New Testament books he authored. The Book of Romans: This Romans course, using textbook and video resources by Douglas Moo, brings the meaning of Paul’s great letter into the twenty-first century. Moo comments on the text itself, explores issues in Paul’s culture and in ours that help us understand the ultimate meaning of each passage, and suggests ways in which the eternal theology of Romans can be understood and lived out in our modern culture. Galatians: This course uses textbook and video resources by notable scholar Thomas R. Schreiner, offering students a focused introduction to deeper study of Galatians. Through graphic representations of translations and succinct summaries of main ideas, Schreiner presents Paul’s Epistle to the Galatians with precision and accuracy. Letters to the Church: This course incorporates textbook and video resources by respected New Testament scholar Karen Jobes. The course introduces the cultural and theological background of Hebrews and the general epistles. Coming from an evangelical perspective, Jobes addresses issues of historical relevance as well as how these books connect with Christian faith and practice today. How do I begin my studies to earn my Pioneers Bible Certificate? First, you need to apply to the BibleMesh Institute by going here. Be sure to select “Pioneers Bible Certificate” as the program you are interested in. Upon your enrollment in the Institute, we will assign you a qualified academic tutor who will guide you through each course of study. 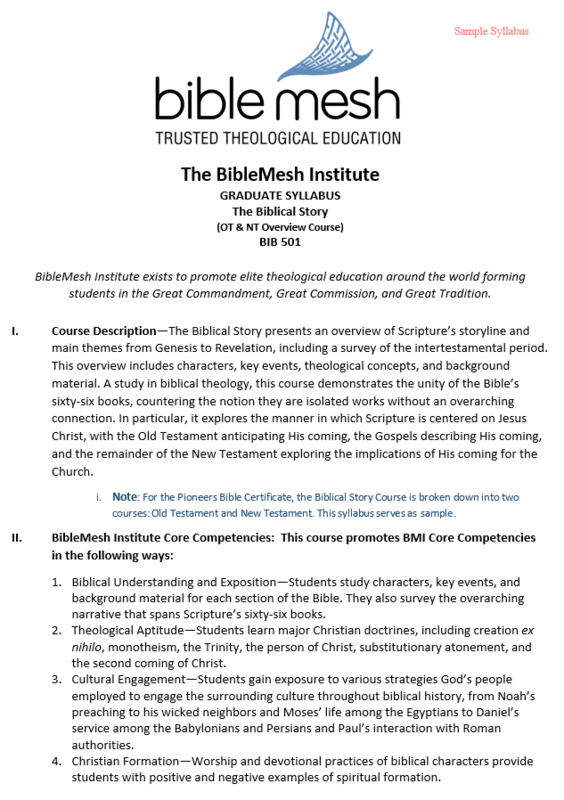 Students enroll in the BibleMesh Institute on a subscription basis. The monthly cost for each BibleMesh Institute course is $225 per month. The length of time to complete a course varies depending on each student’s situation, but averages 3 months for dedicated students. To provide the highest quality online learning experience and to meet academic standards, the BibleMesh Institute assigns each student an academic tutor for each course. All of our proctors (academic tutors) are highly qualified in their subject field. Can anyone receive a Pioneers Bible Certificate from the BibleMesh Institute? Anyone can take the six courses listed in the Pioneers track, but only those who are members of Pioneers are eligible to receive the actual Certificate. To learn more about Pioneers click here. Upon finishing all the courses in a certificate program, you may apply for and receive a certificate. When scholarships are available they are initially available to students already studying in the BibleMesh Institute.